^ "Northern Territory". [email protected]. Retrieved 22 January 2013. Darwin is the capital city of the Northern Territory of Australia, situated on the Timor Sea. It is the largest city in the sparsely populated Northern Territory, with a population of 145,916. It is the smallest, wettest and most northerly of the Australian capital cities, and acts as the Top End's regional centre. 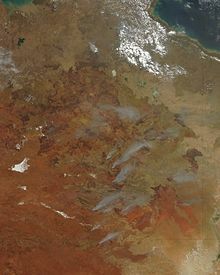 Uluṟu-Kata Tjuṯa National Park is a protected area located in Northern Territory of Australia. The park is home to both Uluru and Kata Tjuta. It is located 1,943 kilometres (1,207 mi) south of Darwin by road and 440 kilometres (270 mi) south-west of Alice Springs along the Stuart and Lasseter Highways. The park covers 1,326 square kilometres (512 sq mi) and includes the features it is named after: Uluru and, 40 kilometres (25 mi) to its west, Kata Tjuta. The location is listed with UNESCO World Heritage sites. Alice Springs is the third-largest town in the Northern Territory of Australia. Popularly known as "the Alice" or simply "Alice", Alice Springs is situated roughly in Australia's geographic centre. Katherine is a town in the Northern Territory of Australia. It is situated on the Katherine River below the "Top End", 320 kilometres (200 mi) southeast of Darwin. It is the fourth largest settlement in the Territory and is known as the place where "The outback meets the tropics". 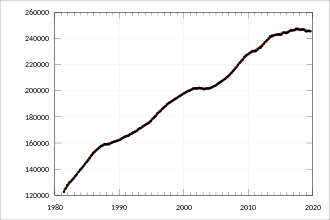 Katherine had an urban population of approximately 6,300 at the 2016 Census. Katherine is also the closest major town to RAAF Base Tindal located 17 km southeast and provides education, health, local government services and employment opportunities for the families of Defence personnel stationed there. In the 2016 census, the base had a residential population of 857, with only around 20% of the workforce engaged in employment outside of defence, the majority commuting to work in Katherine. Arnhem Land is one of the five regions of the Northern Territory of Australia. It is located in the north-eastern corner of the territory and is around 500 km (310 mi) from the territory capital Darwin. The region has an area of 97,000 km2 (37,000 sq mi), which also covers the area of Kakadu National Park, and a population of 16,230. In 1623, Dutch East India Company captain William van Colster sailed into the Gulf of Carpentaria and Cape Arnhem is named after his ship, the Arnhem, which itself was named after the city of Arnhem in the Netherlands. Yulara is a town in the Southern Region of the Northern Territory, Australia. It lies as an unincorporated enclave within MacDonnell Region. At the 2016 census, Yulara had a permanent population of 1,099, in an area of 103.33 square kilometres (39.90 sq mi). It is 18 kilometres (11 mi) by road from world heritage site Uluru and 55 kilometres (34 mi) from Kata Tjuta. It is located in the Northern Territory electorate of Namatjira and the federal electorate of Lingiari. 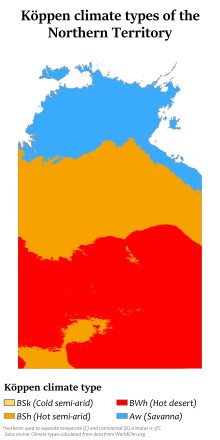 The Northern Territory is the most sparsely populated state or territory in Australia. Despite its sparse population, it has a network of sealed roads which connect Darwin and Alice Springs, the major population centres, the neighboring states, and some other centres such as Uluru, Kakadu and Litchfield National Parks. Some of the sealed roads are single lane bitumen. Many unsealed (dirt) roads connect the remoter settlements. Major roads are classified into three categories: National Highway, Arterial Roads, and Secondary Roads. Pine Creek is a small town in the Katherine region of the Northern Territory, Australia. As at the 2016 Census there were 328 residents of Pine Creek, which is the fourth largest town between Darwin and Alice Springs. 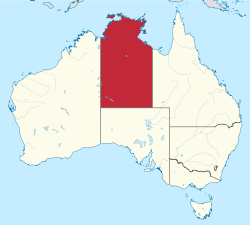 Crime in the Northern Territory is managed by the Northern Territory Police, the territory government's Department of the Attorney-General and Justice and Northern Territory Families. Australian Football in the Northern Territory has a history dating back to the 1910s and is the most popular sport in the territory, particularly with indigenous Australian communities in Darwin, Alice Springs and the Tiwi Islands. Batchelor is a town in the Northern Territory of Australia. The town is the current seat and largest town of the Coomalie Shire local government area. 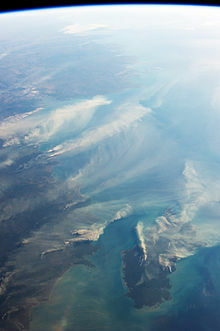 It is located 98 kilometres (61 mi) south of the territory capital, Darwin. A number of residents commute to Darwin and its suburbs for work. In the 2016 census, Batchelor recorded a population of 507 people, with 36% of aboriginal and Torres Strait Islander origin. Aboriginal Australians believe that The Dreaming, cultural values, spiritual beliefs and kin-based relationships of the local people cause some areas or places to be sacred. The Ltyentye Apurte Community, also known as Santa Teresa, is an Arrernte indigenous community in the Northern Territory, Australia, located about 80 kilometres (50 mi) south-east of Alice Springs. .
Malarndirri Barbara Anne McCarthy is an Australian politician and former journalist who has been a Senator for the Northern Territory since 2016. 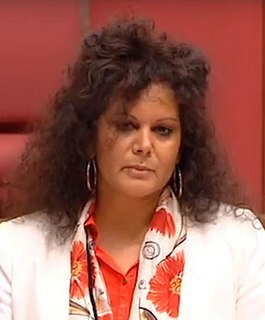 She is a member of the Labor Party, and previously served in the Northern Territory Legislative Assembly from 2005 to 2012. This is a list of National parks of the Northern Territory, Australia.